In those days, VPN has been a necessary tool for Internet users to protect privacy. To ensure your privacy is truly protected, you need to sign up with a reliable VPN provider. So, which VPN should you trust? Do you heard of Norton Secure VPN? What does the VPN program of the leading security company offer? Does it protect users’ privacy well? Is it safe enough to safeguard your online session? Is Norton Secure VPN a good choice for streaming and torrenting? Get the answers in this Norton Secure VPN review based real test result. Norton Secure VPN is owned by Symantec Incorporation. It first was the Norton WiFi Privacy program. Now, it is the Virtual Private Network which is a very helpful Internet tool. With the background of the leading provider of computer security, it has the advanced technologies and robust features to offer a solid VPN service. Norton Secure VPN offers help to convert your private information like your business secret, passwords, bank details and credit card numbers into an unreadable, untraceable form until they get to their final destination. It channels your Internet data through their remote servers that are encrypted with advanced encryption standard. Your IP address is replaced by a new one offered by the VPN provider. Snoopers and ISP won’t be able to track or monitor you online. This VPN has an inbuilt ad tracker protection which blocks cookies and tracker that put users’ identity at risk. Its worldwide network enables users to access your favorite websites, videos or apps when travelling abroad, even though they come with geo-restriction. Norton Secure VPN offers a 7-day trial version with all features to let users try their service thoroughly before they purchase a plan. This advanced VPN is affordable which costs $3.33 USD per month. Besides, it has 60-day refund policy. It is surely a risk-free service. Norton Secure VPN works multiple platforms, so you can install it on your PC, Mac or mobile device for protection or Internet freedom. Is Norton Secure VPN Secure? Internet users suffer various cyberattack and data breach frequently on insecure network. Hackers use man-in-the-middle attacks to intercept sensitive information that users send or receive via the Internet. They also can exploit vulnerabilities of your system to drop malware on the device. If you need to communicate with your partners or shop online frequently you should secure your connection to the Internet. How to secure your connection? Does it require technical knowledge to operate? In fact, you only need a VPN. Install Norton Secure VPN, and it will establish secure connection for you. It creates a virtual tunnel between your device and server, and the tunnel is encrypted. All your Internet data will be channeled through this encrypted channel. Norton Secure VPN uses bank-grade security encryption key to make your data unreadable for others. It uses AES which is the current benchmark in VPN industry. This VPN combines the two key lengths of AES-128 and AES-256 to ensure you have unbreakable protection. The encryption key only allows you and the receivers to access it to decipher the data and read it again. Likewise, Norton Secure VPN supports OpenVPN which is the most popular VPN protocol which comes with the highest encryption standard and can maintain high connection speed as well. It keeps your sensitive information safe from prying eyes when using Internet on Mac, PC or mobile device even when you use public WiFi hotspots or other insecure network. You can check your email and communicate with your friendly securely at public place like coffee house, airport and hotel. How many Sever Locations are Available? Norton Secure VPN has servers in 73 locations across 29 countries, covering all 6 continents. It covers Internet users’ most popular server locations around the world. You can access to servers in Africa, Europe, the Americas, the Middle East, and the South Pacific. The provider allows unlimited server switching, so you can connect to any of the provided servers. If you don’t need specific server for special purpose, you can connect to the server that is close to your real location for faster connection. Let the VPN client choose server for you automatically if you don’t know which server is better for. It will connect you to the proper server for best possible connection. When you are connected to remote server, you have a new virtual location which may give you cheaper prices on some websites and access to contents that come with geo-restriction. As your Internet data goes through the encrypted servers, the ISP can’t view your traffic or throttle your connection. Besides, the provider does not limit your bandwidth or speed. The global server locations allow you enjoy the original Internet it should be. Norton Secure VPN network allows you to access the Internet without so many limits and restrictions. How does Norton Secure VPN Protect your Privacy? During the use of Norton Secure VPN, we route the user’s internet traffic through Symantec’s network, which is a “No Log” network. This means that Symantec does not store the user’s originating IP address when connected to Norton Secure VPN and therefore Symantec cannot identify individuals. Symantec’s automated rule-based traffic management may require real-time analysis of internet data traffic, including destination websites or IP addresses and originating IP addresses, though no log is maintained regarding this information. Symantec does not store information about the applications, services, or websites which the user downloads, uses, or visits. If you move to a different country, you may notice there are Internet restrictions that stop you from accessing your favorite contents like you do at your hometown. Actually, many streaming services and video games come with geo-restriction. Contents on those platforms only can be showed to users in certain countries or regions as the streaming services have license agreement with the copyright holders. To prevent users from other countries accessing their contents, streaming services, like Netflix, Hulu, Amazon, Pandora and BBC iPlayer block VPN aggressively. Many VPNs fail to work with those streaming services these days. Luckily, Norton Secure VPN still can help you unblock Netflix, Hulu and more streaming services abroad. It uses advanced tunnel and technologies to bypass the VPN block and geo-restriction effectively. If you would like to stream videos on Netflix abroad, you need to connect to a server in the US before you open Netflix websites. It gives you full access to the local movies and television series. You will be able to travel around with access to your favorite contents. In addition, VPN is a useful tool for people who would like to download torrents privately. P2P and torrents are popular among Internet users because they are very convenient ways to share files online. However, users’ private information can be exposed when sharing files. Adware, malware and other unwanted programs can come with torrent and P2P traffics. Others can track to you easily. Norton Secure VPN allows you to download and upload securely and anonymously. Your IP address is hidden and your traffic is encrypted, the ISP can’t determine who you are and what you do over the Internet. Your connection won’t be throttled or blocked. You will be able to enjoy streaming services and download torrents via amazing connection privately. Does Norton Secure VPN work on your device? Norton Secure VPN has clients for Windows system, MacOS, Android and iOS devices, and they still are working on spreading service across more platforms. You can install the VPN app on your desktop, tablet and smart phones, so you can browse the web privately, conduct important online activities securely and bypass geo-restriction effectively on any device next to you. When you purchase a VPN plan, the provider allows you to select number of devices you would like to cover. That is flexible and meets users’ different needs. It lets you choose one, five or ten devices. If you only need VPN for one device, you don’t need to pay for multiple devices. It is a big plus of the service. Five is the average number of devices. You can choose to sign up monthly or yearly. The provider runs promotion on the yearly billing, and users can save $40.00 USD when purchasing yearly plan. It costs $39.99 USD to protect five devices for one year. It is only $3.33 USD per month which is quite affordable. You can protect all of your devices with one single account. Norton Secure VPN clients are well-designed and easy-to-use. It does not require complicated configuration to get started with this service. Simply follow the wizard to set up the VPN and connect to server you need to experience the original Internet without restriction. From the client, you can see a virtual location tab that displays a list of 29 countries. Tap on them and select a server you like, and it will automatically close your current connection and switch you to the server you selected. If you have any confusion or issue with the service, you can contact their customer support. Norton Secure VPN provider offers support via telephone, live chat, forum and social media platforms on Facebook and Twitter. If you need direct and instant support, contact them via live chat or telephone. It is easy to find common technical issues and solutions on their active forum where users and developer with good knowledge of the product answer your questions and offer effective solution. You also can contact the VPN provider on Facebook and Twitter. How to Get Started with Norton Secure VPN? 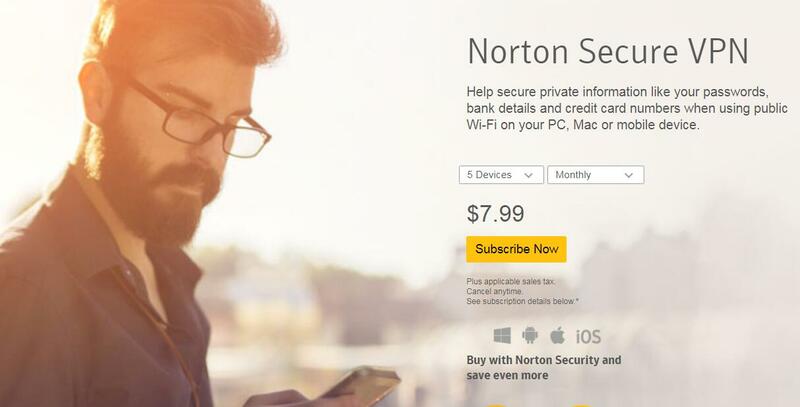 You may know less about Norton Secure VPN than Norton security suites. How to get Norton Secure VPN? First of all, you need to visit the VPN provider and copy promo code if it is available. Secondly, scroll down to the bottom of the page and look for Norton Secure VPN among the product categories. Thirdly, click on Norton Secure VPN product, and it will redirect you to VPN product page. Fourthly, select amount of devices and billing cycle to proceed. If you need security program as well, you should consider the bundles because they are cheaper than you purchase them separately. Finally, click “Proceed to Secure Checkout” to fill up information to finish the payment. Activate your account download VPN client on your device by following the guide in the email sent from the provider. Once the VPN is installed, connect to a server and it is ready to work for you. Norton Secure VPN is a reliable Internet tool that enables users to browse the web over both public and indoor networks freely without comprising their security and privacy breach. It offers worldwide IP addresses and server locations to disguise users’ real IP address and location to prevent tracking. It utilizes bank-grade encryption to secure users’ online activities and supports advanced VPN protocols to stop others from intercepting users’ online session. It protects users’ Internet privacy and create secure tunnel for users to use confidential information securely online. It helps users bypass geo-restriction and download torrents safely and anonymously. 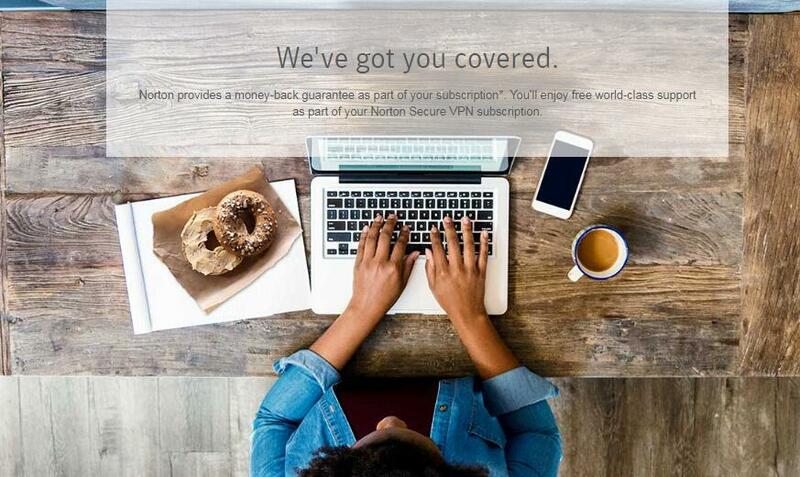 Norton Secure VPN has money back guarantee, so you can try the service without a risk. The VPN is simple to use, and the customer support is always available for you if you have problem in using the service. It gives you options to cover ten devices with one subscription. It only costs $3.33 USD per month if you sign up one year for five devices. Norton Secure VPN is a solid service that is worth your trust.